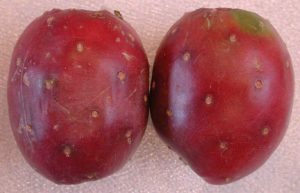 Prickly pear and Indian fig are common names for cactus fruit (Opuntia stricta), which grows on the Nopal cactus, a southern Florida native. Studded with barbs, the prickly pear fruits are oval and 3 to 4 inches long, with skin colors ranging from reddish to greenish-yellow to orange-tan. 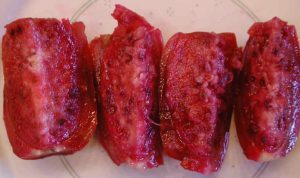 The reddish-purple flesh contains hard, edible seeds which, unfortunately, take away some of the fun of eating this sweet fruit which is a good source for vitamin C. Available in the produce department from August to December, purchase prickly pears that give slightly to pressure and allow them to ripen until soft on your countertop. When ripe they may be refrigerated for up to a week. When ready to eat, carefully avoid the barbs while slicing off both ends. Then score down the length of the skin and peel it away. The fruit may be cut into pieces for eating. (Photo-right, to enlarge click on photo or link) See nutritional chart below.